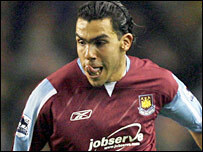 Argentine striker Carlos Tevez has been cleared to play for West Ham. The club were fined a record £5.5m on Friday for breaching Premier League rules over the signings of Tevez and fellow Argentine Javier Mascherano. The Hammers were also warned that Tevez would be ineligible to play unless they cancelled the third party agreement that existed in his original contract. The club made quick progress on a new agreement and have now received the Premier League's clearance. A club statement read: "Following discussions with the FA Premier League, West Ham United can confirm Carlos Tevez is available for selection for the rest of the season, including Saturday's game against Wigan Athletic. "The actual registration of Carlos Tevez has not been called into question and he remains a West Ham United player approved by the Premier League." The ruling over Tevez's contract was handed down by the same independent tribunal which fined the club for breaking two Premier League rules relating to the signing of the Argentine duo. Mascherano has since moved to Liverpool on a loan deal. West Ham are still considering whether to appeal against the punishment, but Tevez says he feels no guilt about the situation. He told The Sun: "It is not my problem, it is between the club and the Premiership. "I don't feel guilty because I have always acted in good faith. The fans know that and that is why they love me. "Ever since I have been at West Ham I have only ever worried about playing as well as I can and giving my best to the team. "It is a complicated situation but I am sure these problems and the team's bad position in the table were not caused my myself and Javier Mascherano. "Right now I just want to put my mind to the match against Wigan."